This weekend marks the 16th annual Del Close Marathon and I have tickets to see ASSSSCAT on Sunday. I am insanely excited and that is an understatement. I don't know how JD deals with me. I sound like one of Mischa's squeaky toys every time I say it out loud. It's not even guaranteed that the UCB 4 will definitely be there. So since Billy's now closes at 9pm on Sundays (I could have sworn it used to be later, but I could very well be wrong) and I probably shouldn't have any additional sugar anyway as I will presumably already be giddy, I decided to have my cupcake early and swap out Friday's happy hour post for a sweet treat. 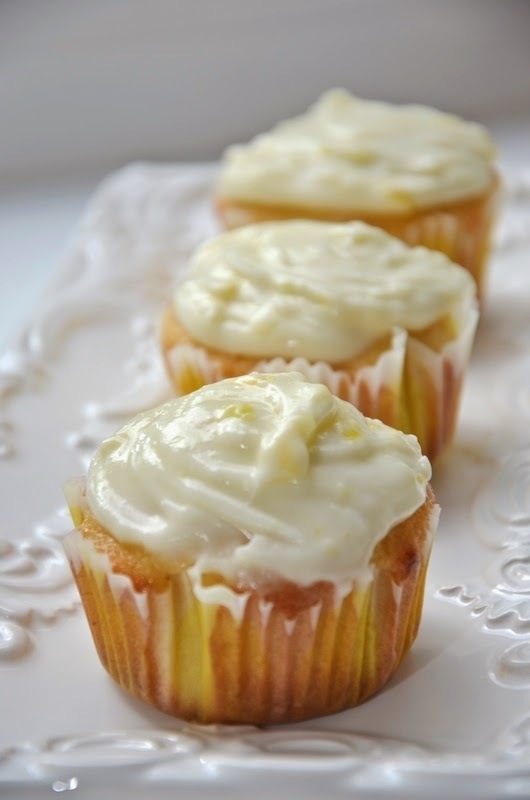 Lately, I have been really into everything lemon flavored so when I came across a recipe for lemon cupcakes it was a no-brainer. I had to make them. The original recipe for the cupcakes (only) said it would yield 15-18 so I cut the recipe in half, making 8. JD and I hardly need 8 cupcakes. I don't know what I'd do with 18. In a mixer, beat melted butter and sugar until smooth. Add eggs one at a time, mixing as you go. Then add vanilla, lemon juice, and lemon zest. Carefully add in flour mixture and milk. Line a cupcake or muffin pan with liners and fill about 2/3 full. 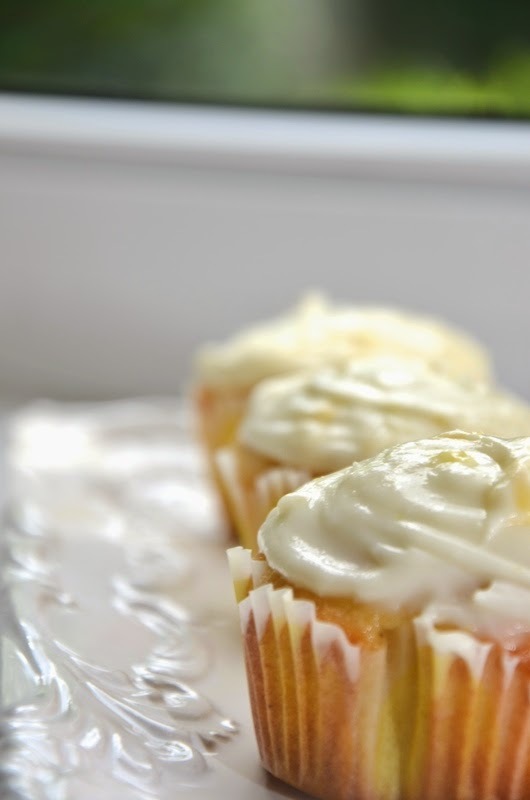 To make the frosting, mix room temperature cream cheese and confectioners sugar together until smooth. Add lemon juice and zest and mix until creamy. 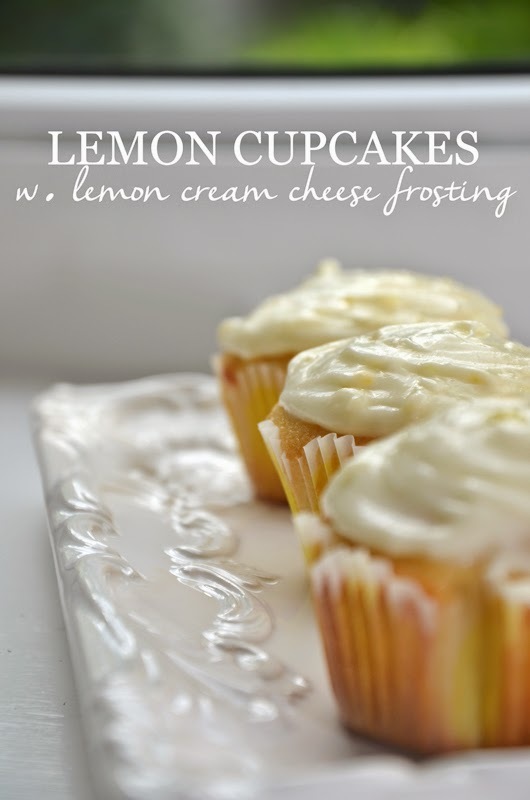 I know everyone isn't a fan of lemon flavored sweets, but these came out so good. If you're in the mood for something sweet but also a little tart, these cupcakes come recommended! Those sound and look absolutely delicious!! Yummm! I've had these a few days ago and they are delicious! These cupcakes look so yummy! Mmmm if it's not chocolate or caramel it has to be lemon! These look so delicious! i saw these on your instagram and thought they looked incredible..i'm such a sucker for cupcakes, and these have a nice, summery twist! yum! Totally saving this recipe! Ooohhhh lemon cakes and cupcakes are my absolute favorite. These look incredible! Yum! These look amazing. :) I haven't made cupcakes in forever (I usually stick to muffins because my brain wants to fool myself into thinking they're "healthier"). Plus, I always feel so pressured when making cupcakes because I know I won't feel right unless the frosting looks pretty and that's the hardest part for me to do.